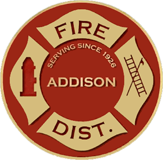 From time to time, the Addison Fire Protection District will write, pass and/or enact certain ordinances, resolutions and proclamations. These documents are often required by Illinois statutes or District policy. An Ordinance is a piece of legislation (authoritative order or decree) enacted by the Board of Trustees who serve as the elected governing body of the Fire District. A Resolution is a written motion adopted by the Board of Trustees. A Proclamation is a public and/or official announcement made by the Fire District through the Board of Trustees.